Laboratories are typically regarded as an energy intensive building typology. Many of these buildings have extended occupancy periods, energy intensive equipment and machinery, and in some cases, strict air quality code requirements (high air changes per hour). These factors contribute to a high average energy use intensity value (National Average EUI of 370 kBtu/SF/year). Nevertheless, there are many strategies that can be employed to make laboratories more energy efficient as well as healthy and productive spaces with minimal environmental impact. The Human Evolutionary Biology(HEB) Shared Lab is a great example of the successful implementation of these strategies. 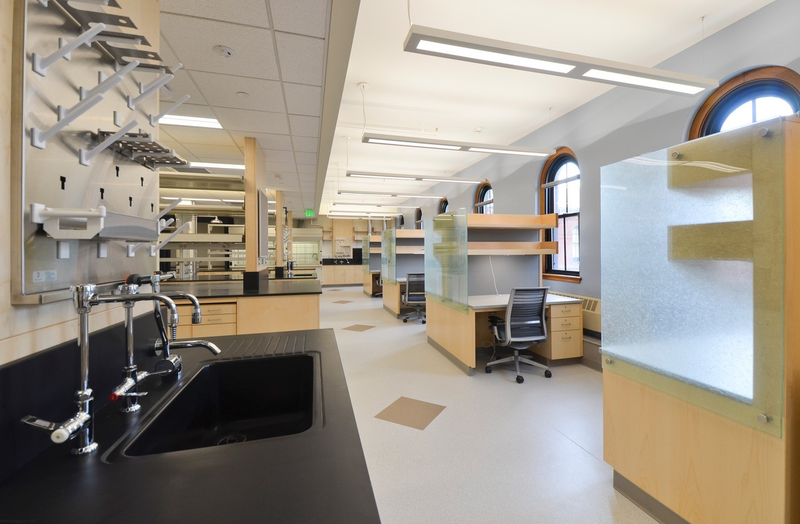 The Human Evolutionary Biology (HEB) Shared Lab project consisted of the renovation of the existing laboratory space located on the fifth floor of the Peabody Museum. The scope of work included adjusting the floor layout; upgrading HVAC, lighting, and controls; and replacing laboratory equipment for research purposes. The project’s goals were to create a high performance lab space that optimizes the indoor environment, reduces resource consumption, and reduces the overall impact on the environment. The project team was committed to sustainability from the onset and followed the Harvard Green Building Standards to make more informed decisions. These standards led to the inclusion of a number of progressive design strategies to meet aggressive energy targets and reduce water use without significant additional cost. The project achieved LEED-CI v3 Gold certification in 2017.